They say all good things must come to an end. 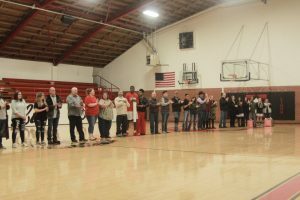 For four Luther Lions basketball athletes and their families, the end of an era came Tuesday night as Syrus Grisby, Luke Mohr, Caitlin Bailey and Lauren Coates played their last home basketball game in the “old” gym. There might have been a few tears shed. Coach Carrie Schwarz, Bailey, Coach Johnny Vick and Coates. Coach Vick credits these players for helping to turn around Luther’s girls basketball program. Lions fans spilled over to both sides of the gym for the evening that featured Senior Night to celebrate 18 seniors and their parents. Students were honored for their participation in Basketball, FFA, FCCLA, Track, Choir and Powerlifting. 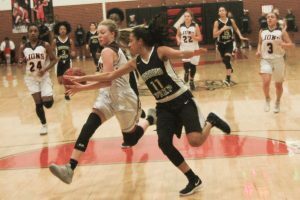 Both teams gave the home crowd VICTORIES against Harding Charter Preparatory High School from Oklahoma City. 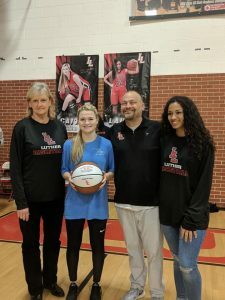 Bailey added to her rack up of a career 1,000 points earned in Altus last month with 13 points against Harding. Coates had 14 points and led with rebounds with 12. 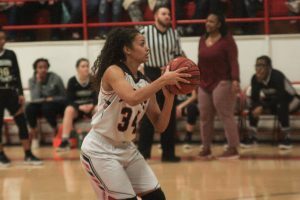 Freshman Shawntae Silva and Junior Raychel Stanfield each had 15 points. Stanfield also had ten rebounds and five assists. 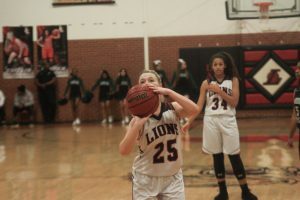 Final Score: Lady Lions 61, Harding Charter 54. 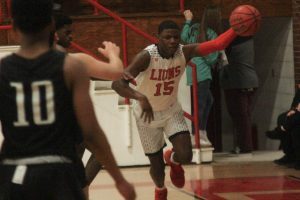 For the boys, the Lions game back after trailing at the half by eight points and scored 40 points in the second half for the win: Final 62 – 55. 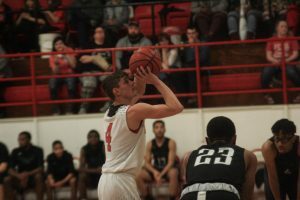 Grisby scored 27 points, pushing him closer to a career 1,500 points accomplishment. He’s only 45 points away with two more regular games left in the season. Junior Tyler Becker had 13 points. Other scorers were Nick Hines with nine, Gerald McCauley with five, Luke Mohr with four, Fredrik Greenhoward with three and Jack Lombard with two points. The last two games are at Meeker and Community Christian. Then it’s District play with the LIONS traveling to Crescent as they begin their march to the State Tournament. 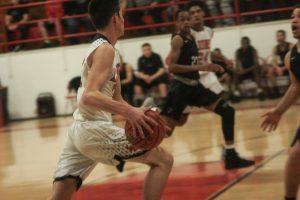 Full 2A Area 1 OSSAA Basketball Playoff brackets have been released. 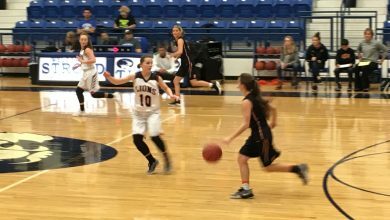 Both teams play Saturday, Feb 16th in district tournament at Crescent High School against the Crescent/Tonkawa winner. Congratulations to the Seniors, and thanks to Lion Reporter Jacob Factor for the photographs. The Luther Register needs your support to continue covering athletics for Luther High School. Without support, we are in danger of shutting down our sports coverage. If you read our stories about Luther athletes, please give monthly. News isn’t free, nor is sports coverage. We ask for through our website. Or if you have a business, why not buy an advertisement? Read about the Seniors here; and enjoy a slideshow of the evening. Follow Jacob Factor, the Lion Reporter on Twitter and Facebook.